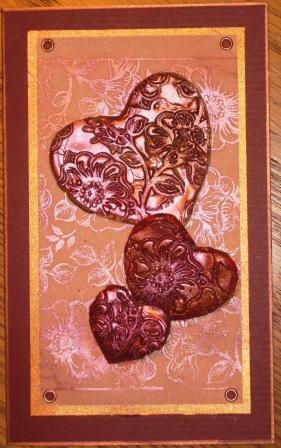 This is the card that I have made for my sweetie and look what he has done for me in exchange!!!!! We went to an auction last week and saw this computer desk/armoire and he bought it for me for $25 (no-one else saw the potential) and he added all the little shelves on the doors for my stamps. What a treat this is! No more rummaging around in a drawer to find a stamp. 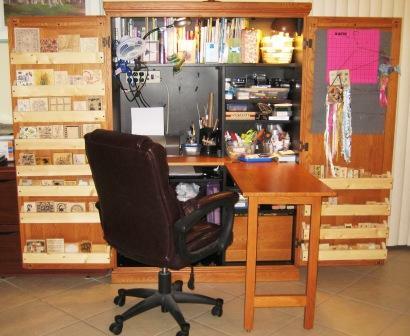 I have all the things I use regularly to hand, a place for my computer and printer,reference books on the top shelf, inks and embossing powders on shelves, glues and pens and tools all within easy reach. 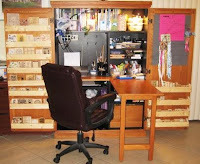 The gate leg table folds down and I have a work surface, a hook on the door for my cutting mats and ribbon hangers, shelves under the table for papers, paints, score pad, paper cutter, knitting bag and a deep drawer to hold my cuttlebug and cricut. Oh what a treat this is and how organized I am for once. I wonder how long I can keep it clear and tidy?